Congratulations to Dr. Karen Koch, as she was elected as “Fellow” of the AAAS (American Association for the Advancement of Science) and received this award at the national meetings in February, 2013, Boston, MA. UF Hort Sci Professor Karen Koch is recognized with this distinct honor. 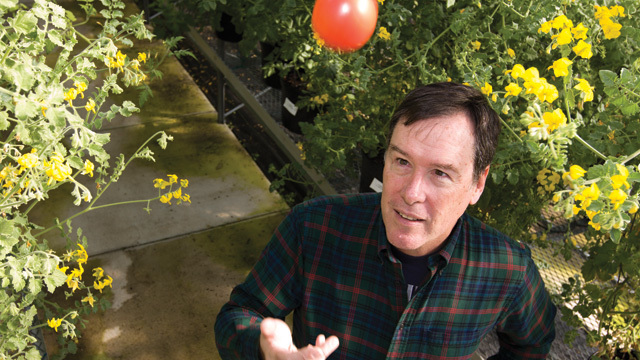 UF Horticultural Sciences professor Dr. Harry Klee and his team of researchers are making tremendous headway in understanding why tomatoes taste the way they do. More appropriately, they are understanding why tomatoes don’t taste the way we wish they did! Recent results are being presented this week at the prestigious American Association for the Advancement of Science annual symposium in Boston, MA. Flavors and aromas are produced by a complex cloud of volatile organic componds that interface with sensors equipped to detect them. Together this mix of hundreds of compounds, in conjunction with sugars, acids and other “taste” activators, provides a stimulation to the brain that defines the sensory experience. In other words, the chemicals present in tiny amounts in fruits activate receptors in the nose and throat that provide the brain with flavor and aroma information. Plant breeders have sought high yields, great shelf life and disease resistance. Many of these gains have come at the expense of flavor. Now that scientists like Klee have a handle on how flavors are produced, it is now possible to define breeding targets to introduce key metabolites back into commercial tomatoes. Dr. Linda Bartoshuk from the UF School of Dentistry has studied how flavors and aromas are sensed and what triggers a consumer’s “liking”. Together with Klee’s groundbreaking work, it is possible to narrow and prioritize which chemicals are most important and which ones should be re-introduced to tomato first. This research leads to a better understanding of the flavor compounds produced by tomatoes and why we like them. The work promises to improve fresh tomatoes, but also processed tomato products. Today the trend is changing and Dr. Vance Whitaker and Horticultural Sciences graduate student Alan Chambers are working to add back flavor. In the lab, the diploid strawberry (Fragaria vesca) is used to identify genes and understand how they contribute to flavor and aroma. This information is then used to inform breeding decisions based on the presence or absence of specific genes. The goal is to use traditional breeding to speed production of the high quality cultivars the UF breeding program is known for– only with improved flavors. The whole story is can be read on TechNews Daily. 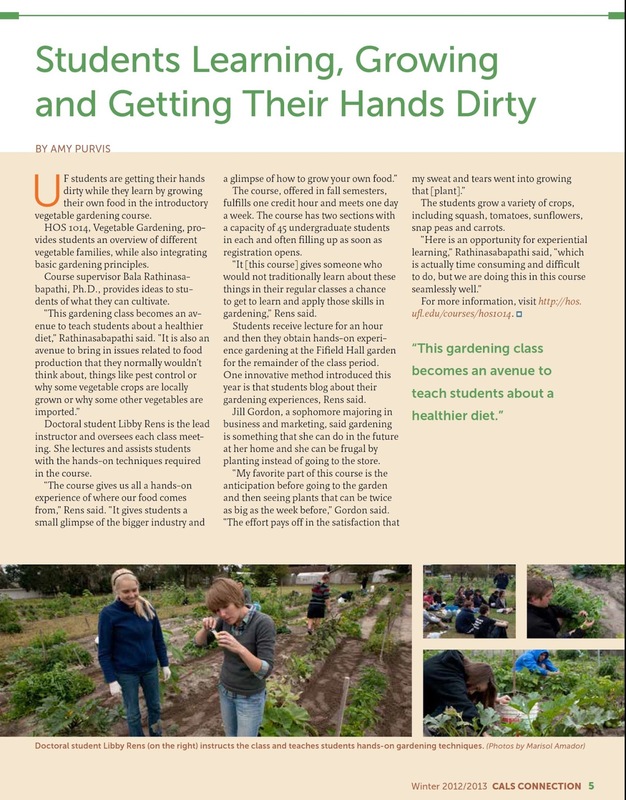 A recent write up in CALS Connection described Dr. Saba Rathinasabapathi’s HOS1014 course, emphasizing student learning through a hands-on experience.